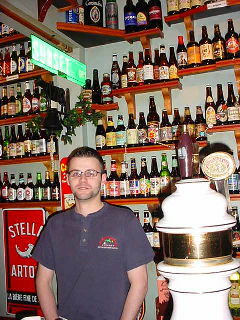 In December of 2004 Owen Ogletree and Kerri Allen traveled to Boston, MA to seek out the best beer places this old town has to offer. This page lists the brewpubs, bars, restaurants, and pubs that offer the best beer selection and atmosphere. Boston's subway and train system (called the "T") make it very easy to navigate around the city; and flexible, week-long T passes are sold at subway stations for a very reasonable fee. Most of the roads in Boston trace the routes of old cow paths and make this one of the worst places in the USA to try to drive. Use the addresses below to map out locations on any mapping website (closest T stations are also included for most places). Also go online before your trip and purchase a CityPass that will give you quick and inexpensive admission to the best museums and attractions in Boston. Don't miss the JFK Library, Harvard Museum of Natural History, Museum of Fine Arts, New England Aquarium, Science Museum, Prudential Skywalk Observatory, and the shops and restaurants of Little Italy/North End. Print out this page and head to Boston for a delightful beer experience! Bambino Ale - The beer that helped break the curse! This is a golden ale with a slight floral hop finish and a toasty malt flavor. Fenway Park Ale - An American Pale Ale with lots of Cascade hops - very dry and drinkable. Special Pale Ale - Dry-hopped with Kent Goldings, it has a grassy, herbal note. Back Bay IPA - A nice brew that is made with copious amounts of resiny American hops. Boston Red - Crystal / caramel malt flavors with good hop balance. Centennial Alt - Light Munich malt notes - mild and nutty. Beantown Nut Brown - Nutty aroma with a dry, mineraly malt flavor. Buckeye Oatmeal Stout - Dry and grainy with notes of roasted malt. Blueberry Ale - Nice golden ale with good fruit flavor - served with a few real berries floating in the glass. Hercules Strong Ale - Dark copper with sweet, fruity malt and resiny hops - 10% alcohol. 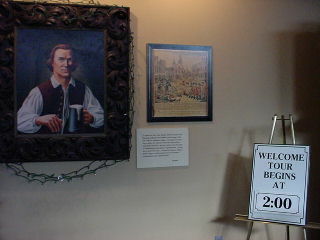 This is the original John Harvard's brewpub. It is located in the basement of a shopping building just a stone's throw from the oldest university in the USA. 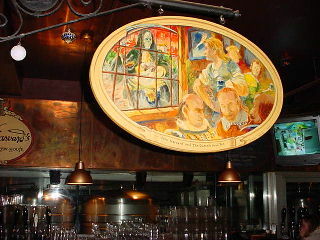 The pub has an "antique" feel about it with dark wood, rock walls, murals, and stained glass. The food here is absolutely wonderful with appetizers, pizzas, sandwiches, and really delicious entrees. 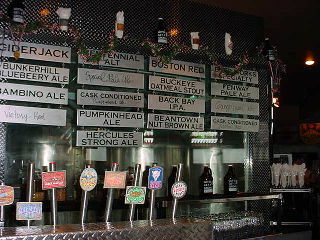 The house beers are a bit inconsistent at times, but in December of 2005 we were pleased. Colonial Kolsch - Clean, light, and true to form. Pale Ale - A bit weak in the hop department. Dry and a bit herbal. Old Willy's IPA - Clean malt - light in hop bitterness and flavor. Oatmeal Stout - Malty and oaty with a background of roasted and chocolate malts. Nitrogen dispensed. Seasonals are also rotated that include a Trippel, Christmas Ale, Harvest Spiced Ale, and tasty cask ales that are properly served. This is a very worthwhile and attractive pub on Beacon Street. The bar is to the left of the main entrance and there are quaint seating areas to the right and rear of the pub. They offer a staggering array of draft and bottled beers from around the world (with nice food items to match). Check the long chalkboards for the current draft selections. The walls are adorned with old photos and beer signs. Don't miss Anam Cara (it is just a short taxi ride from Sunset Grill listed below). 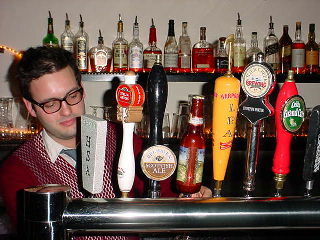 Pictured to the right is the Bukowski's Cambridge manager, Max Toste (who looks like Elvis Costello). These bars are fantastic and very beer-focused. 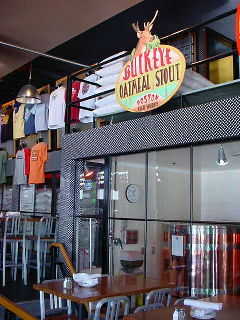 Opened in 2002, Bukowski's offers a very interesting selection of microbrews, craft beers, imports, and some rare and unusual beers from around the world. There are around 100 bottled beers and 15 drafts from which to choose. The decor is like a diner from the 1950s, and the pub menu is unique and eclectic. Christopher's is a slightly upscale bar and restaurant in north Cambridge that usually has one or more of the beers from Cambridge Brewing Company on tap. 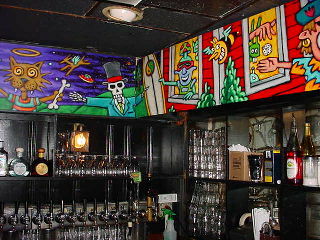 There is cool folk art adorning the walls, and 24 decent draft beers and around 20 bottles. The restaurant is to the left and the bar to the right. Check out the quaint Scottish shop next door run by an old couple from the UK. Doyle's has as much history and personality as any pub in Boston. 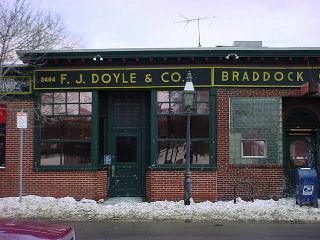 Established in 1882, Doyle's has been visited by JFK (Sr. and Jr.) and a multitude of other notable Boston natives. 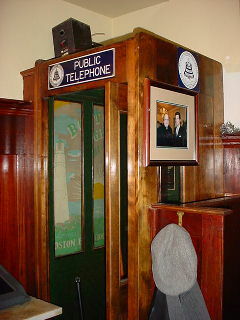 The antique phone booths found throughout the pub are remarkable, and you could spend hours just looking at the old wall photos and newspaper clippings. Take the T orange line south to Forest Hills (go during the daytime as the neighborhood is a bit suspect at night) and walk out of the station left under the bridge. Head down Washington about three blocks and you'll spot the pub on your right. You'll be able to partake of old-style pub meals here along with about 30 draft beers (Harpoon, Sam Adams, Smuttynose, etc.) and some notable bottles like Chimay. 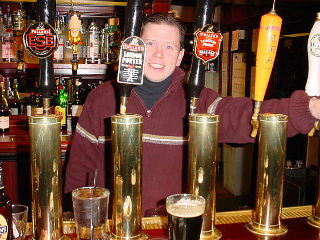 Ask for a sample of a draft beer before you order a pint, as sometimes a beer can go a bit stale here. Doyle's only accepts cash money. 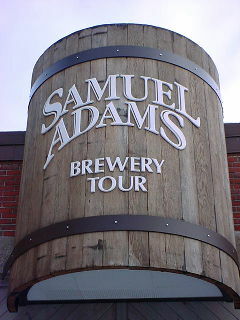 The pub is only a 20 minute walk or a five minute taxi ride to the Samuel Adams brewery in Jamaica Plain (see bottom). Pictured to the right is the manager of Elephant and Castle pub, Bob Dougherty. Bob was born in Georgia and moved to Boston because of his love for the city. 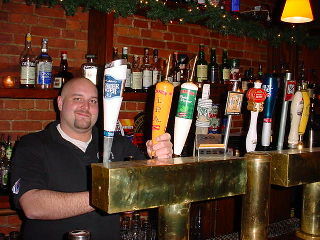 He is a friendly manager and bartender who can help you choose a beer from the pub's 15 taps or 30 bottles. As you can see from the photo, the pub is one of the few in Boston to carry the excellent line of ales from Fuller's (London Pride, ESB, and London Porter). Bottled beers include Chimay, Sam Smiths, Flying Dog, McEwans Scotch Ale, and regional craft brews. 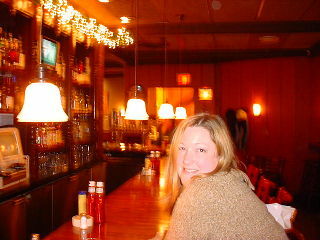 This is part of a chain of pubs that are very well run and attractive, and they serve breakfast, lunch and dinner! Try the fish and chips, Irish stew with Guinness, and excellent burgers. 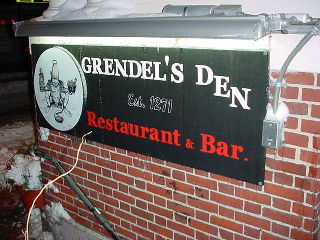 Grendel's is a basement bar and restaurant two blocks from John Harvard's brewpub that is a favorite with students and faculty. The cozy restaurant serves hot pub meals, and the bar always has a dozen draft beers with two or three nice regional beers. A sign behind the bar proclaims, "No Bud, No Coors, No Miller." Try the mulled cider too in the colder months! There is a central bar with small dining areas off to the sides. The Zagat guidebook says that Porters is "upscale for a bar, sporty for a grill." It is one big rectangular room with a wide-open feel about it. There is a large projection TV up front and a good beer selection with the likes of Harpoon, Mercury Brewing Company, Chimay, and Hoegaarden. Try the "Porters Classic Sandwiches," pizzas, and BBQ also. Don't go to Boston without making it to Redbones. Where else in the Boston area can you find brews, barbecue, margaritas, and "southern hospitality?" This place is known for its cool artwork that covers almost every inch of wall space. The beer selection is excellent with 25 bottles and 25 drafts, and you'll find a nice group of seldom seen beers here as well. Choose from five ounce samples or half or full pints -- be sure to try LOTS of samples while you are here. 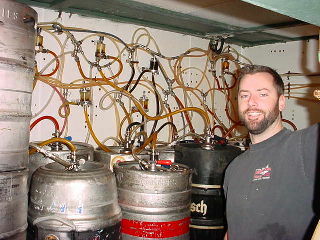 Pictured to the bottom right is bartender Bryce in front of the organized chaos that is the keg room at Redbones. There is seating upstairs and downstairs, and the BBQ ribs and chicken are outstanding. Our FAVORITE place in Boston has to be Sunset. This beer mecca is like a beer festival every day of the week -- customers can purchase draft beers in 2 oz., 5 oz., half pints, and full pints. Try 20 or so 2 oz. samples and then order pints of your favorites -- it's like heaven! 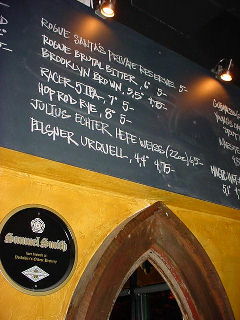 The draft and bottle beer list runs into the hundreds, and the beers are very well cared for and served properly. The food at Sunset is also extremely good. Pictured to the right is manager Joe Rowland who will gladly talk about beer all day. Get off the T and walk right on Harvard Avenue one block. Turn right on Brighton and you'll see Sunset on your right. Tell Joe we said hello. T: Haymarket (orange) or Gov't Center (blue/green). 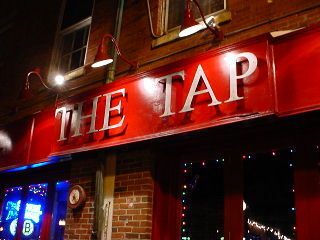 The Tap is a casual pub located near the famous Faneuil Hall. There are two dozen taps at The Tap that encompass a fair range of nice beers. You'll also find dart boards and pub munchies (seafood, pasta, sandwiches). T: Harvard or Central Square (red line). 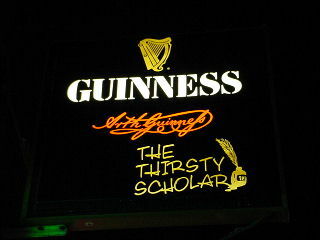 There are 25 draft beers available at the Thirsty Scholar pub near Cambridge. There are some microbrews and regional beers in the crop. 25 mostly uninspiring bottled beers are also available. The place has an English pub feel about it, and the menu is made up of some nice sandwiches, burgers, and steamed mussels. 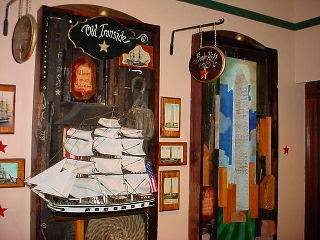 This is a friendly Irish-type pub located very near the Aquarium T stop. There are 20 draft beers here with Anchor Steam, various Sam Adams brands, Pilsner Urquell, Harpoon, and Guinness being the standouts. They also offer Tiernan's IPA which is made for the pub by Harpoon (it tasted like Harpoon IPA pushed with nitrogen). There is live music on some nights (not usually Irish) and great food items like Guinness mussels, calamari, buffalo tenders, shepherd's pie, meatloaf, liver and onions, and steak tips. 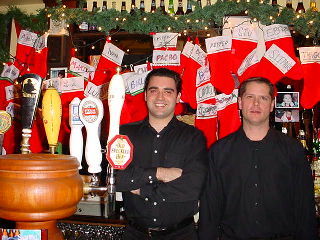 Pictured to the right are bartenders Ron and Kevin at Christmas time. The Union Oyster House claims to be America's oldest restaurant -- a point that is often debated. It is located near historic Faneuil Hall and is famous for its location and great Boston seafood. Be sure to try their awesome clam chowder and steamed oysters. They have a small selection of beers on draft, but often include a very interested brew like Harpoon Munich Dark. The small dining room off to one side of the bar has beautiful 3-D art models of historic Boston locations (see the picture of Old Ironside). T: Stony Brook (orange line south). Black Lager - a Schwarzbier-style beer - much like a mild Stout that has been made with German malt and lager yeast. Pumpkin Ale - a pleasant beer with mild pumpkin flavors and subtle spices (nutmeg and cinnamon). Oak Aged Cider - a New England style cider made with culinary apples - dry and oaky with a bit of vanilla character. Utopias - champagne and ale yeast help produce this huge beer that is 25.5% alcohol and made with big additions of maple syrup and 2-row Harrington malt. Holiday Porter - a robust Porter with caramel, Munich, and chocolate malts. It has a rich, dark malt flavor. 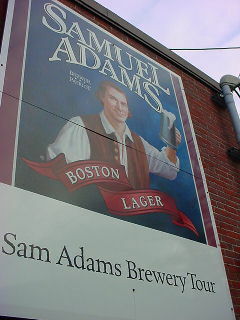 The Boston Beer Company and its founder, Jim Koch, have done so much for craft beer in the USA. Their devotion to quality brewing methods and ingredients really shows during the brewery tour. brewery and its founder, Jim Koch. Cambridge Brewing Company (brewpub), One Kendall Square #100, Cambridge. (617) 494-1994. 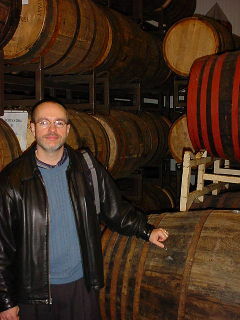 Massachusetts Bay Brewing Company (Harpoon microbrewery), 306 Northern Ave. (617) 574-9551 - call about brewery tours!. Rock Bottom Brewery, 115 Stuart Street, Theater District. (617) 523-6467. Druid Pub, 1357 Cambridge Street, Cambridge. (617) 497-0965. Boston Beer Garden, 732 East Broadway, South Boston. (617) 269-0990. Coolidge Corner, 307A-309 Harvard Street, Brookline. (617) 566-4948. Cornwall's, 510 Commonwealth Ave. (617) 262-3749. Jacob Wirth, 31 Stuart Street. (617) 338-8586. Joshua Tree, 256 Elm Street, Somerville. (617) 623-9910. Parish Cafe, 361 Boylston Street. (617) 247-4777. Tir na nog, 366A Somerville Ave., Somerville. (617) 628-4300.